If I’m honest to myself, then I have to admit, before my journey to Brazil, I hoped to see anywhere and anyhow in any way in any forest any sloth. I was aware about my wish and that it is not easy to meet my wish. However, a tiny ray of hope existed within me. Therefore, I we went to Itaúnas as I heard that in the Parque Estadual de Itaúnas not only live sloths, but also monkeys and wild cats like the ocelot. Moreover, I was curious about this place, because I had read in my travel guide that marine turtles lay their eggs on the beach every year from September to March. According to the travel guide! 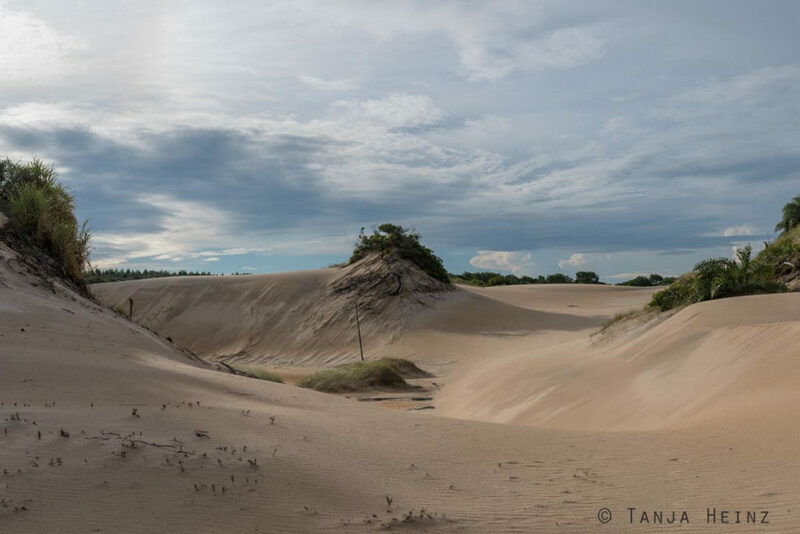 Therefore, I thought the Parque Estadual de Itaúnas must be a paradise for travelers like me who wish to observe wild animals in their natural environment. Nevertheless, I can tell you in advance. I did not see any sloth in Itaúnas. Monkeys neither. Especially no wild cats (I did not expect that). And marine turtles? Just after our arrival in Itaúnas I found out that I most probably would not see any of the animals on my wish list. I understand that I did not see sloths and monkeys (especially no wild cats), as you really need either luck or you need to accompany someone who knows the surrounding area and where to search for the animals. However, I really thought that I might be able to observe – at least a little bit – some turtles. Just after our arrival in Itaúnas I heard from our host that turtles stay in Itaúnas only until February and not until March (like my travel guide says). 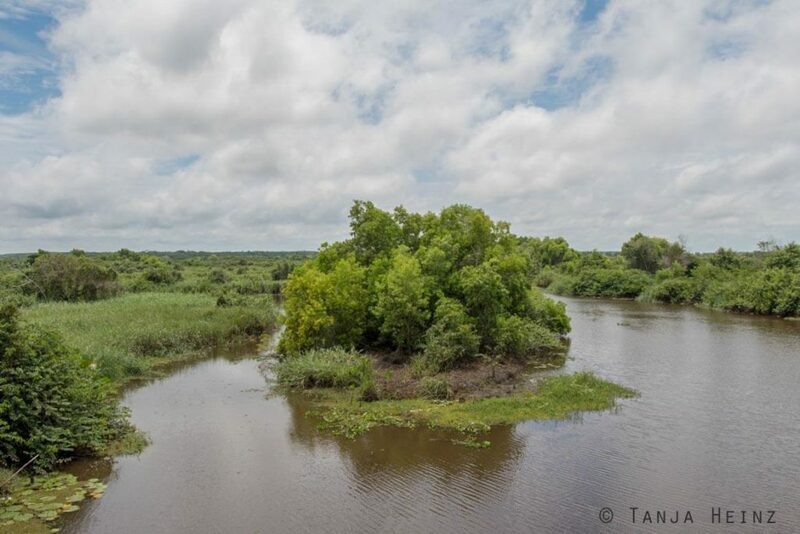 I have to admit that I was a little bit disappointed at the beginning because we just came from the Feliciano Miguel Abdala Natural Reserve where we tried – without success – to find the Northern muriquis. However, this was not fair, because Itaúnas and the Parque Estadual de Itaúnas are – according to me a “forgotten” paradise. Extensive sand dunes along the coast characterize the landscapes. 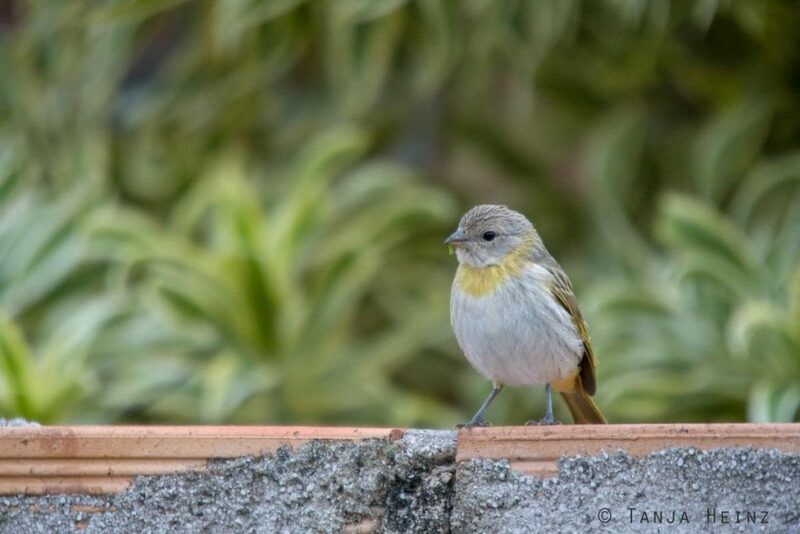 A great variety of birds found a home in Itaúnas (more about birds below). 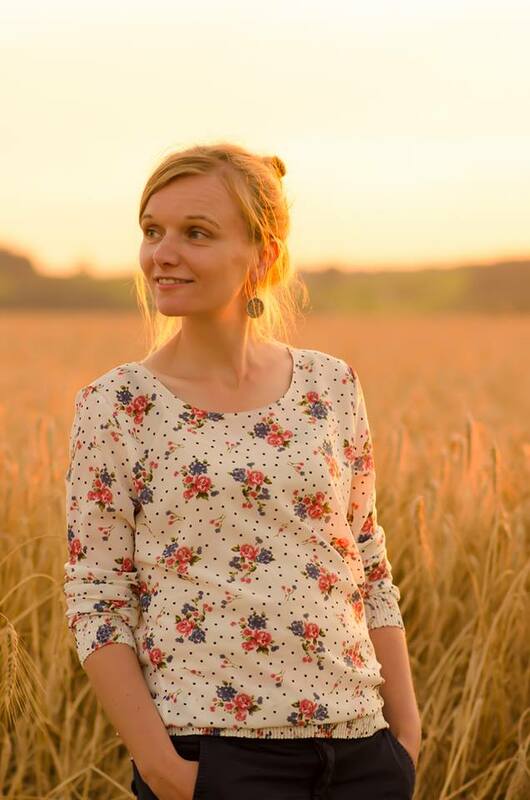 And the local people live quietly and peacefully with the surrounding nature. Itaúnas appeared to me somehow too beautiful to be true. Far away from the world. Just the way I like it. However, “forgotten” might not be the right word for Itaúnas, because we stayed there in March, just after the main season. According to my travel guide Itaúnas becomes a central point for parties from New Year’s Eve until carnival and in July during the forró-Festival again . Hardly to imagine for me. 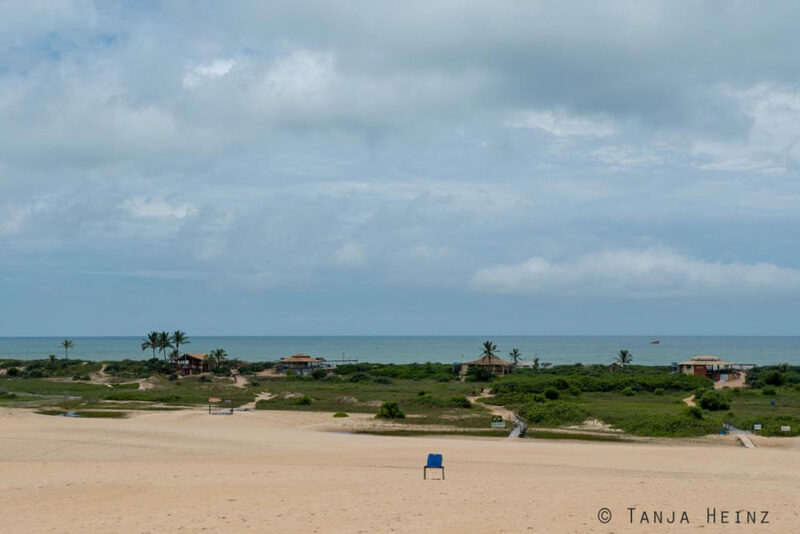 As we visited Itaúnas in March, we had the streets, the beaches, the pousadas and the restaurants almost for ourselves. 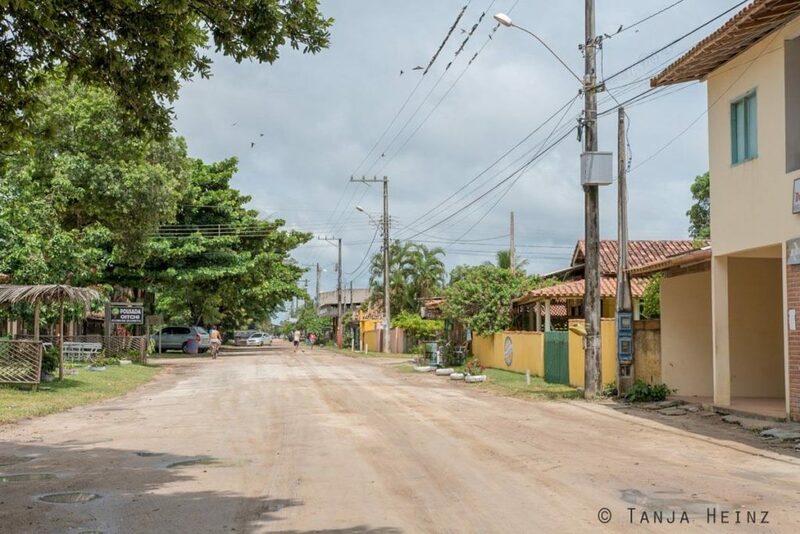 Ok, but I have to add that the number of pousadas (guest houses) can tell you that Itaúnas has a high capacity to accommodate many, many people during the main season. Furthermore, local people told us that the number of pousadas increased rapidly in the last few years. For us march was the perfect month in Itaúnas. Itaúnas is a rather small townlet. 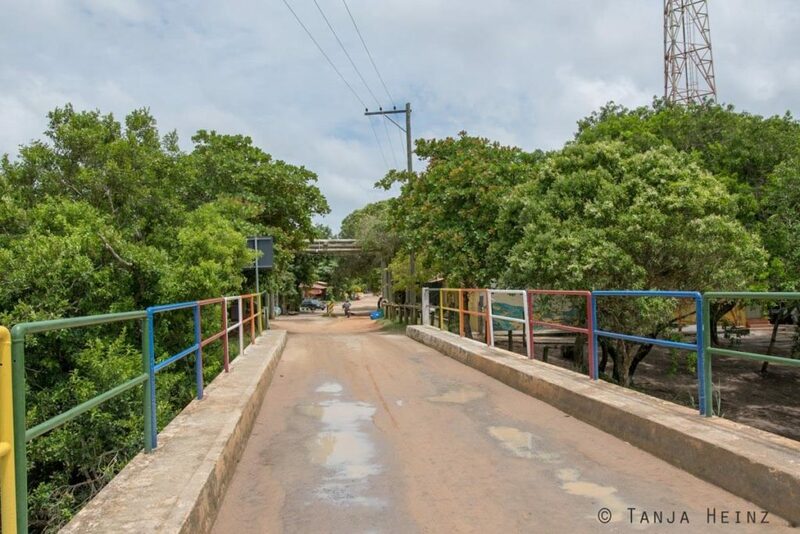 If you enter Itaúnas from the North, you need to cross the bridge over the river Rio Itaúnas. Just behind the bridge you can find different paths that lead to the sand dunes (more about that below). There is one broad street through Itaúnas beginning at the bridge. Close to this street is a site with a church where you can listen to church singings every evening or Sunday (if you like church music). As there is so little traffic on the street, you can see kids playing soccer in the middle of the streets. I especially noticed that restaurant and pousada owners care affectionately and carefully for their flowers in their gardens. 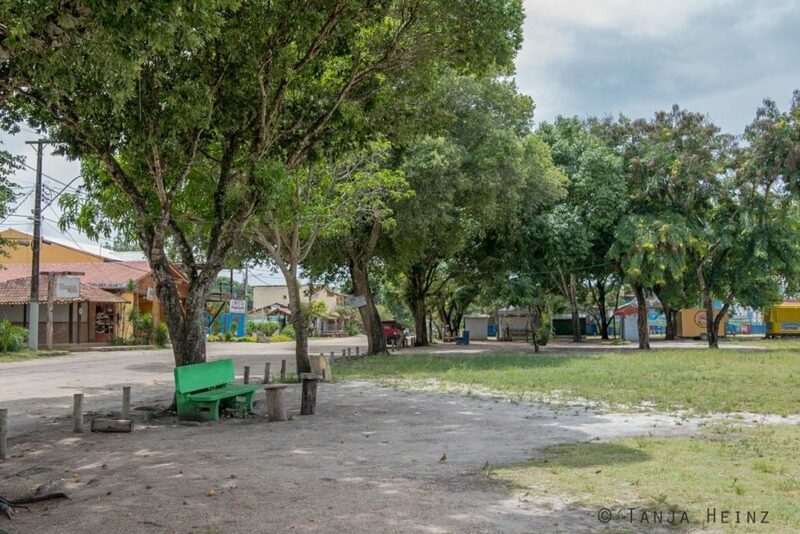 In Itaúnas you find many beautiful, green and shady places. Some people will need it because of the Brazilian climate. 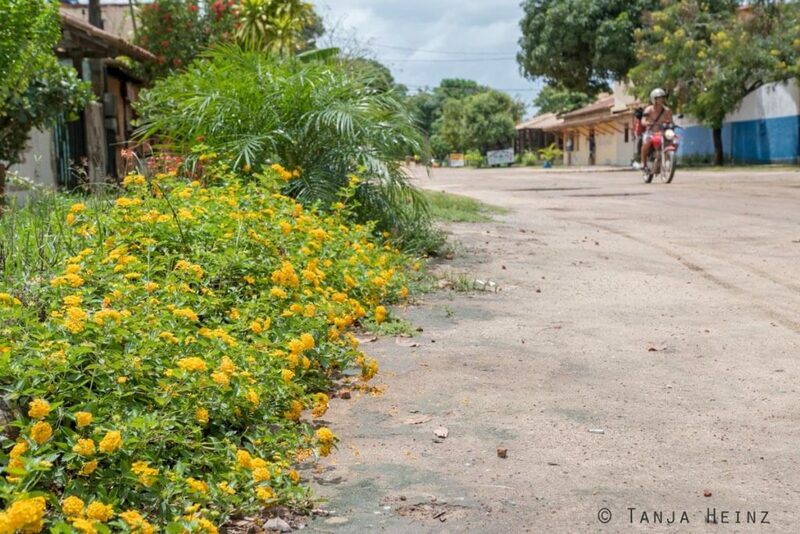 Especially from march onwards owners of restaurants and pousadas have much time to care for their gardens as only few visitors – like us – “get lost” in Itaúnas. It is also possible to sit close to the Rio Itaúnas. The Rio Itaúnas is mostly not accessable in the townlet, but at one point there is a short path down to the river. If you know my article about Ouro Preto then you know that I started with a little “project” on my journey. And that is I tried to identify all animals I encountered in Brazil with the aid of online communities like iNaturalist and wikiAves. In most cases I reached my goal. However, in some cases I was not successful (see for example the butterflies in Feliciano Miguel Abdala Natural Reserve or the hummingbirds in Ouro Preto). As sloths, monkeys or marine turtles where not there, I went on “bird hunts”. Probably for most Brazilians all the birds I saw are very common, because they are so numerous. However, for me the birds were very, very special. One of the most characteristic birds in Itaúnas is the rufous hornero (Furnarius rufus). Also know as joão-de-barro in Portuguese. By the way “barro“ means clay and joão is the Portuguese form of John. I cannot conclude why a Brazilian bird is named John. 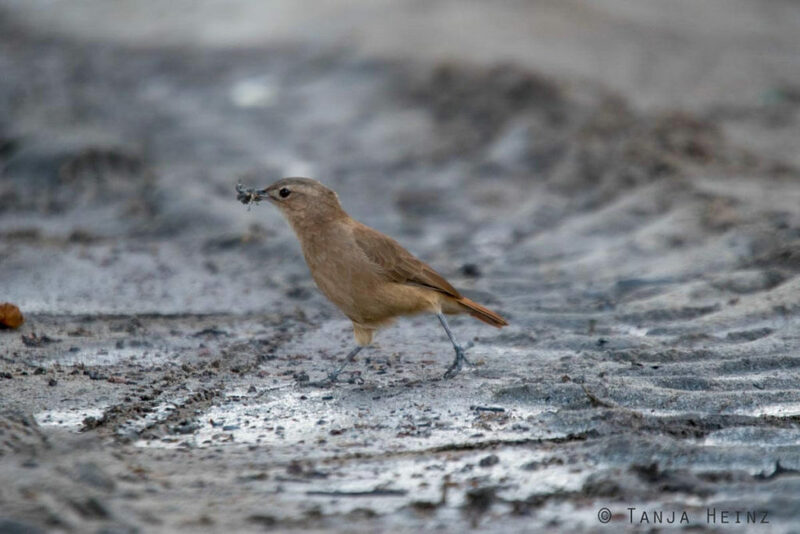 However, “barro” fits very well, because rufous horneros are known to use clay for their nests. 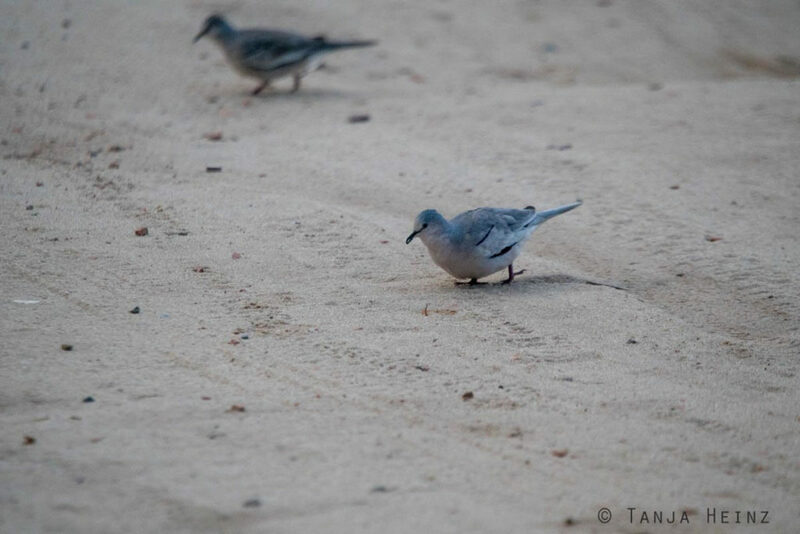 Clay is very useful for the bird, because with this material their nests are more stable. 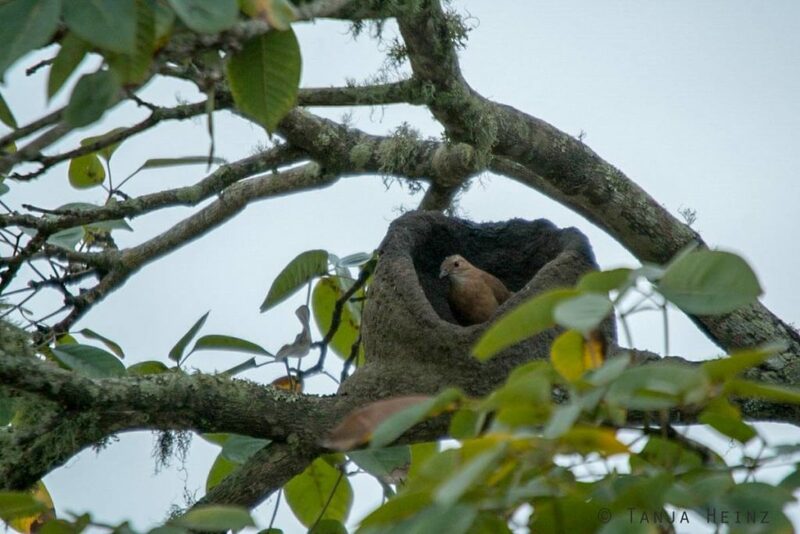 Rufous horneros lay their eggs into their nests – and by the way – a couple stays together for life. On our first day we observed a couple of them building their nest. While one parent was perching on a branch in the top of the tree, the other parent was building the nest. I could not tell if the male or the female was building the nest as both parents have the same appearance. However, they do not lay their first eggs in March, but at the end of the winter between August and December. 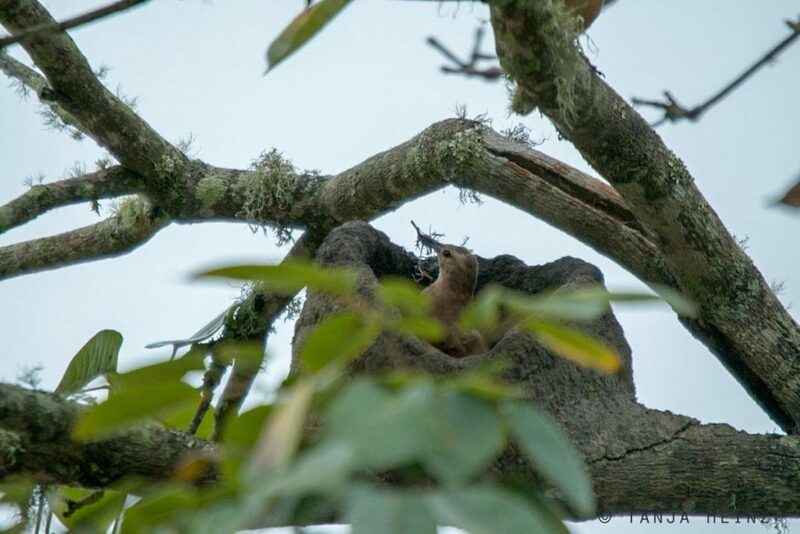 Neverthelesse, rufous horneros start building their nests months ahead. Even in march as we observed in Itaúnas. There was another place in Itúnas where we observed a couple building their nest. But this time we could not see their nest. We only saw how a rufous hornero was looking for nest material. The bird was moving very busy and fast on the ground. Then it stopped to peck into the soil. Sometimes the bird just stopped doing nothing. 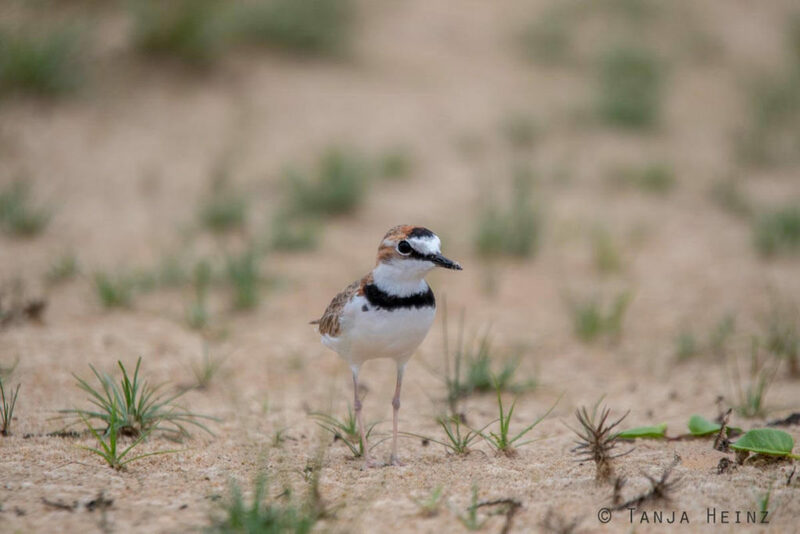 By the way, rufous horneros are perfectly adapted to feed on the ground because of its long and thin legs. Nevertheless, we could not see where this rufous hornero hid its nest. Actually, we did not further observe this rufous hornero, because at the same time another bird aroused our attention. And that was the chalk-browed mockingbird (Mimus saturninus). 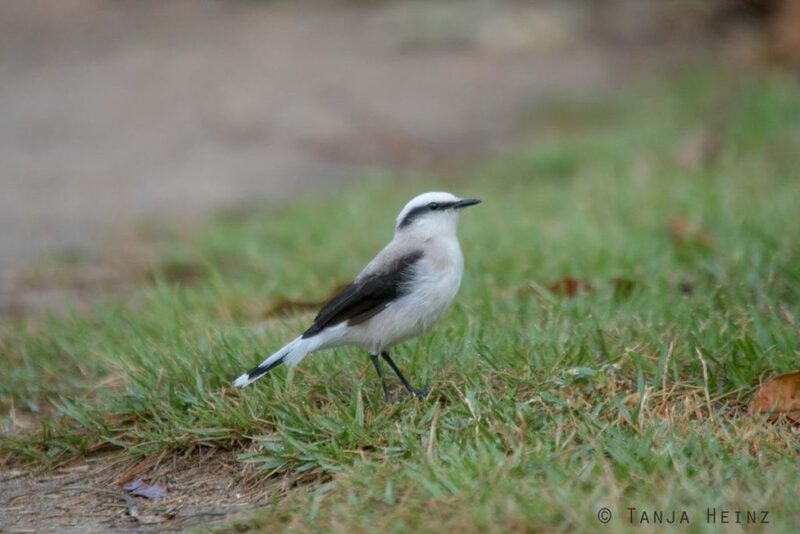 Similar to the rufous hornero, the chalk-browed mockingbird was moving on the ground. 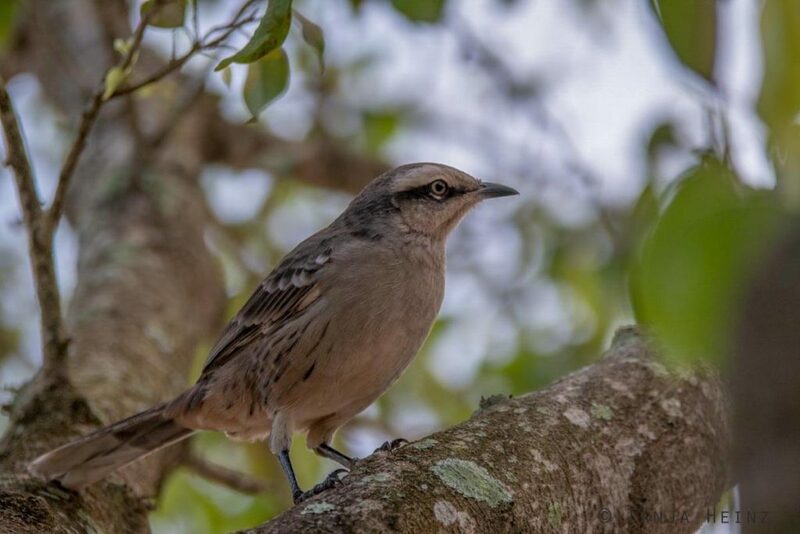 However, while the rufous hornero moved into different directions, the chalk-browed mockingbird did not leave its place but was moving its wings up and down. 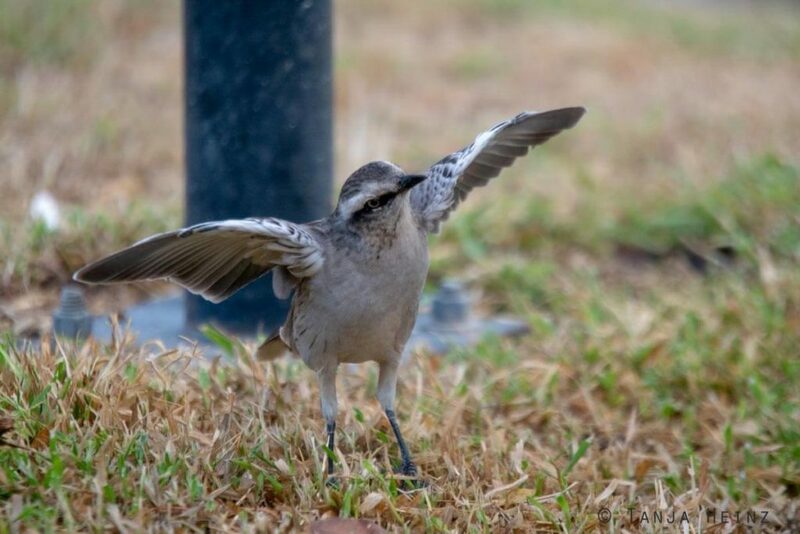 Why do chalk-browed mockingbirds move like this? Is this a method to cool down? Or is there any message for conspecifics I cannot detect? Or is this bird a male that wants to attract a female? It could also be a method to catch insects as their movements could startle insects, and thus, make them more visible to catch for the chalk-browed mockingbird. 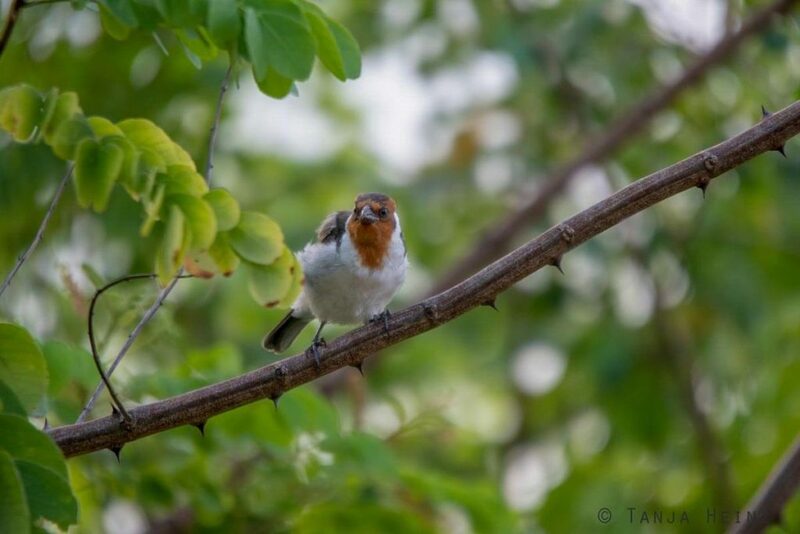 In particular, these birds feed on spiders, worms, fruits and berries, but also insects. Although these birds apparently search for food mainly on the ground, I could observe one individual on a branch hidden in a tree. In general I observed many birds in Itaúnas on the ground. 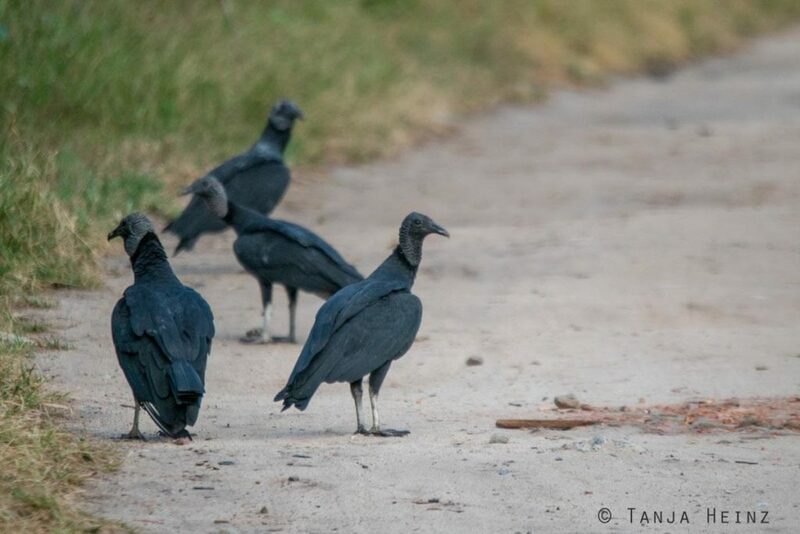 … and the black vultures (Coragyps atratus). 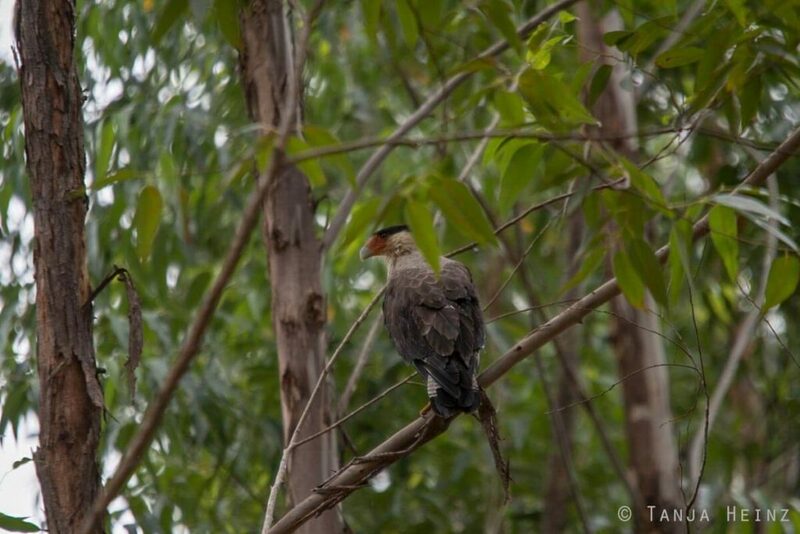 On my journey through Brazil I saw masked water tyrants as well in the Botanical Garden in Rio the Janeiro and black vultures on the Morro da Penha in Vitória. 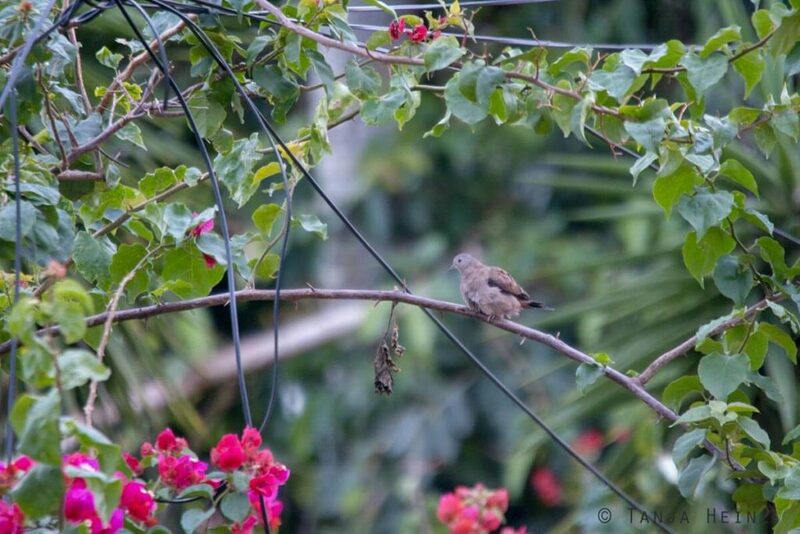 … and the Ruddy ground dove (Columbina talpacoti) perching quietly and almost invisible on a branch. 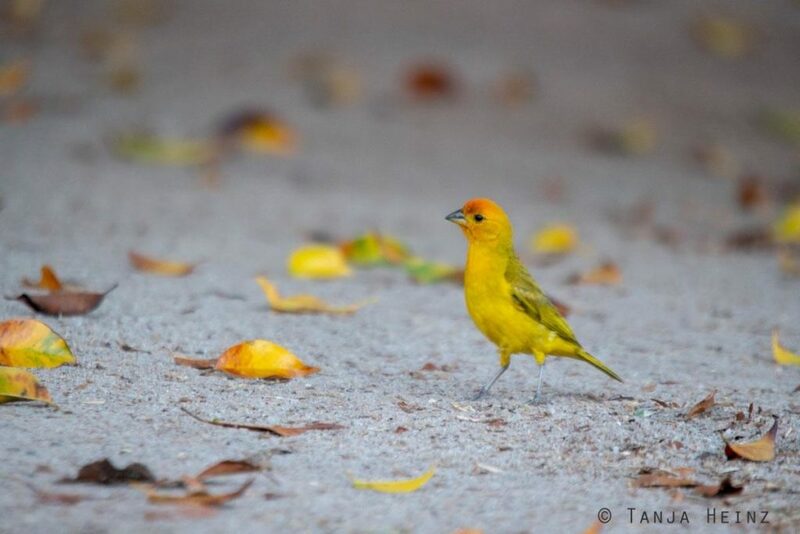 Saffron finches (Sicalis flaveola), in contrast, were more conspicuous, especially the males with their intensive yellow-orange coloration. Females and subadults have less intensive colorations. 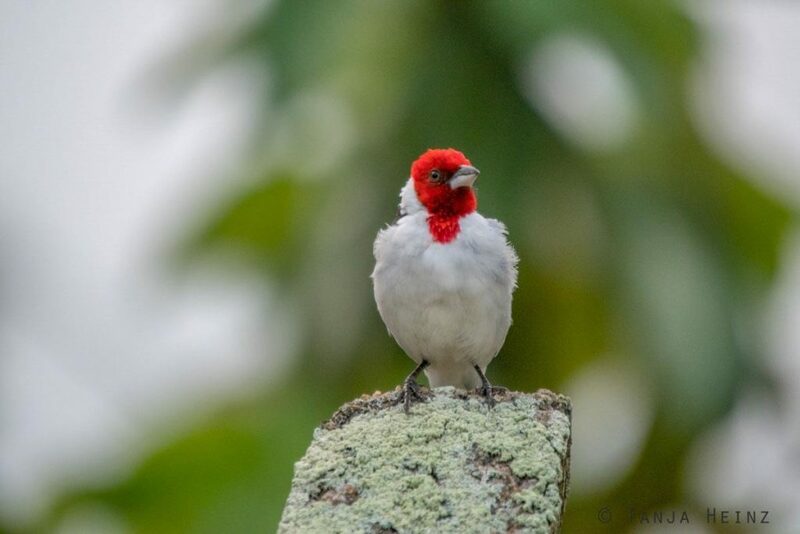 Another common bird in Itaúnas is the red-cowled cardinal (Paroaria dominicana). Like saffron finches, I saw red-cowled cardinals quite often in Itaúnas. I saw mostly two adults (with a red head) and several young (with brown heads) on the ground searching for food. Sometimes the red-cowled cardinals were perching on branches in trees as well. In Itaúnas I especially liked one parrot. And that was the peach-fronted parakeet (Eupsittula aurea). 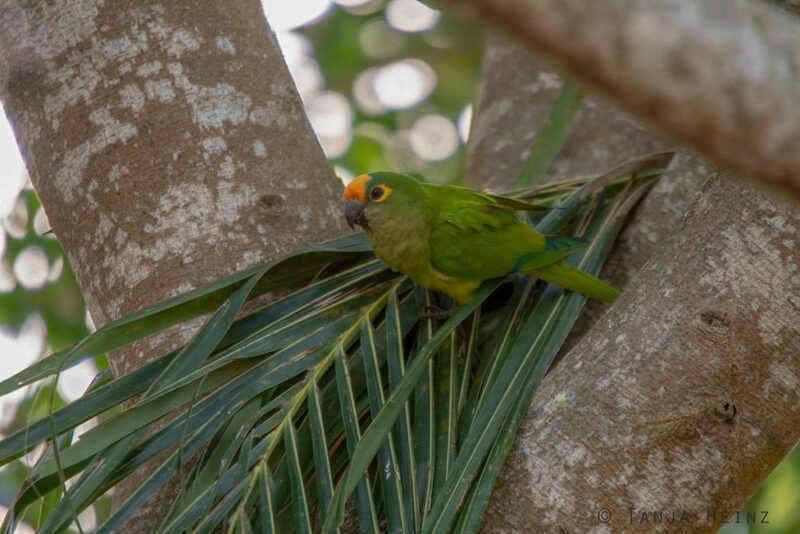 When we were just about to return to our pousada after a bird watching morning stroll, a peach-fronted parakeet was croaking in a tree. Of course, the parakeet got all our attention in that moment. Maybe we would have overseen him if it wouldn’t have croaked that loud. Althoug very noisy I think the peach-fronted parakeet is a very attractive bird with its orange cap and its orange coloration around its eyes. Although the peach-fronted parakeet can croak very loudly – and maybe annoy some people – I was excited about this parrot. It looked kind of “angry” as if it wants to ask us “what are you doing here?”. As this parakeet appeared kind of cranky we stayed under its tree only for a few minutes. If you visit Itaúnas, don’t miss the Parque Estadual de Itaúnas. 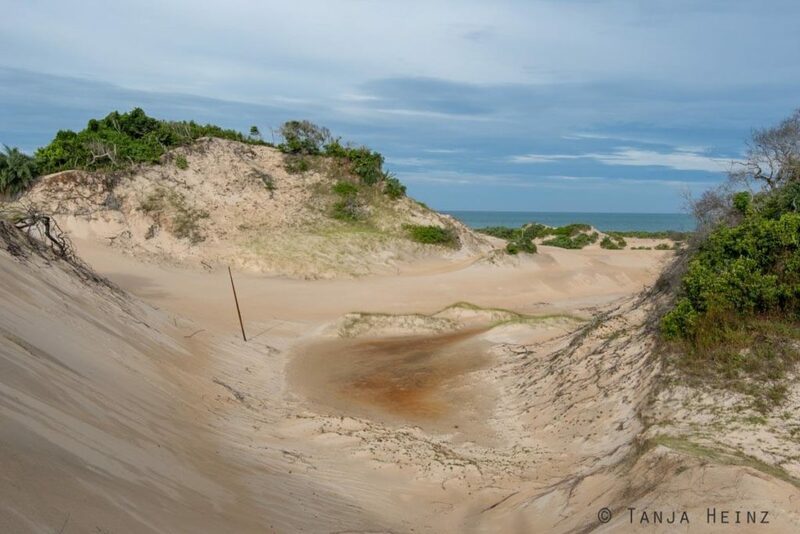 If you leave Itaúnas from the North across the Rio Itaúnas you will find different paths that lead to the dunes. 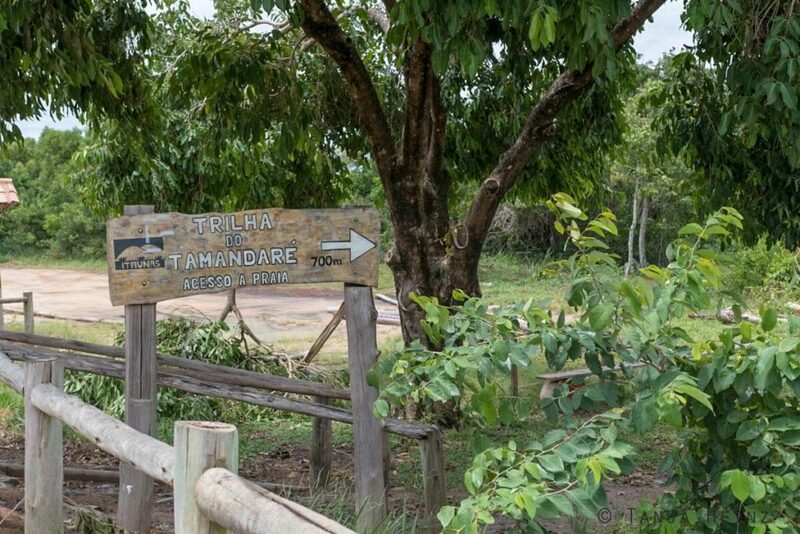 The Trilha do Tamandaré is a path of about 700m. It starts just across the bridge over the Rio Itaúnas. 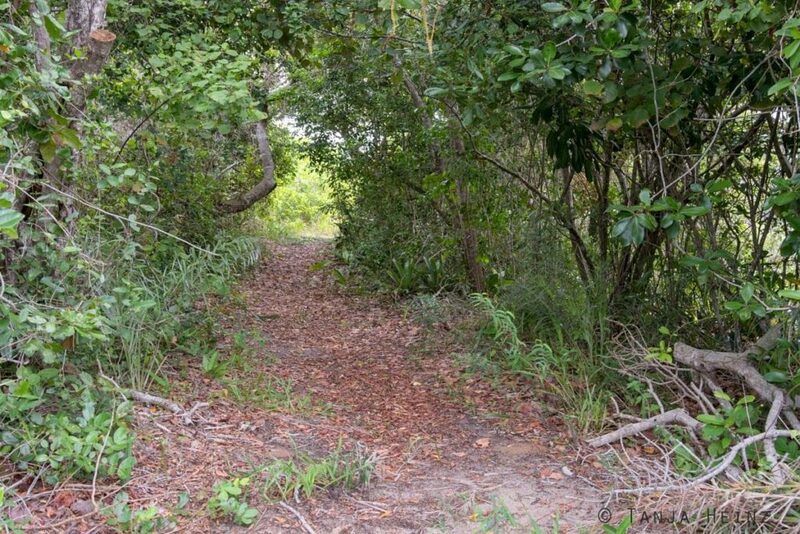 If you go this path you will reach the dunes until the beach. 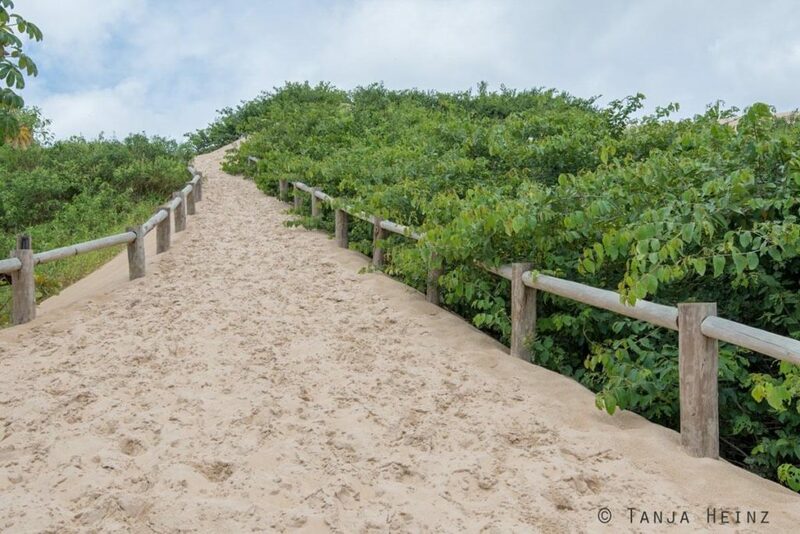 Even at the beginning of this path you not only get a wonderful view over the sand dunes similar to the view at the Trilha do Tamandaré, but also see the beach shacks from afar. At the beach shacks you can swim in the sea, sunbathe or enjoy a coconut under the roof in the shadow of a beach shack. It is also possible to eat Brazilian food at the beach shacks. We drank a coconut and enjoyed the sound of the sea. I asked myself several times: how does this place look like in the main season? I enjoyed very much the quiet atmosphere and that I did not have to encounter crowds of people. … and on the other side one Southern lapwing (Vanellus chilensis). 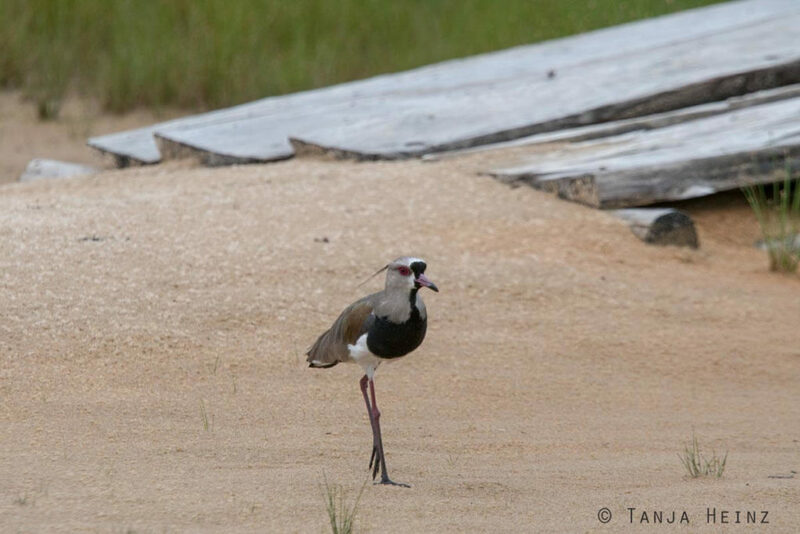 By the way, I met quite many Southern lapwings in Brazil like for example in Guaraparí (as well in Espírito Santo). 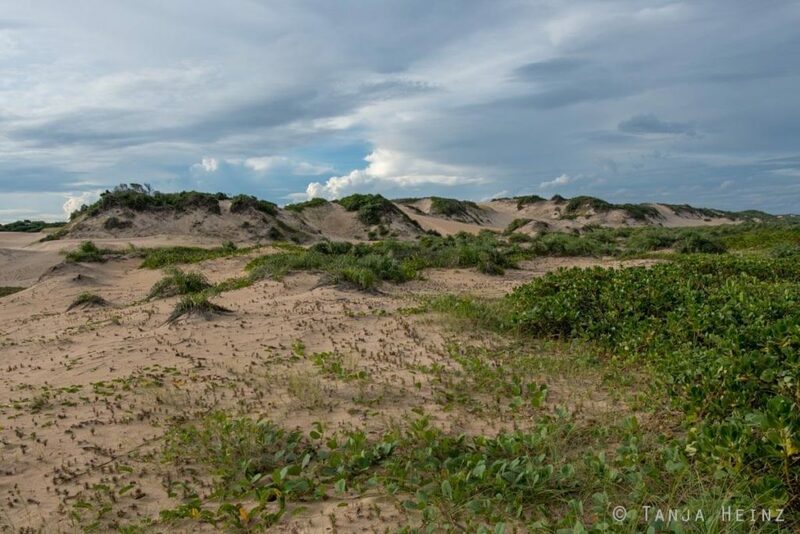 As we wanted to see more of the Parque Estadual de Itaúnas we did not stay such a long time at the beach shacks but left again to walk the next path. My favourite path in the Parque Estadual de Itaúnas was the Trilha Buraco do Bicho. 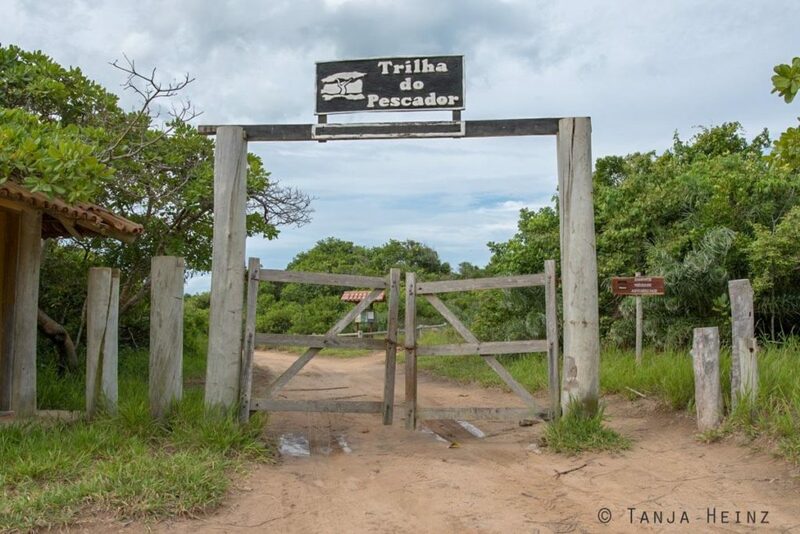 You reach this path if you walk the beginning of the Trilha do Pescdor. The Trilha do Pescador is again reachable from the street that starts at the bridge in Itaúnas. 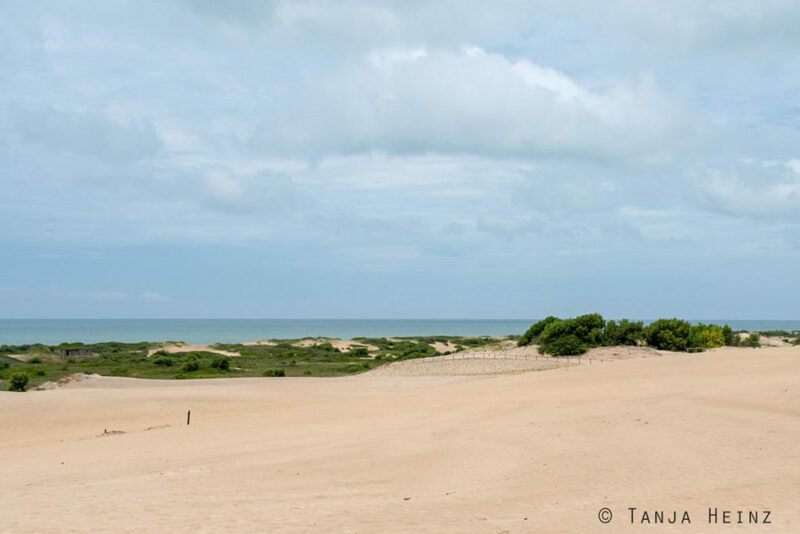 You just have to walk a little bit further than to the Trilha das Dunas. As we walked in the afternoon, we could not observe many birds. It was cloudy, but still warm. I very enjoyed this path. As there were only a few stones, we even could walk parts of the path barefoot. 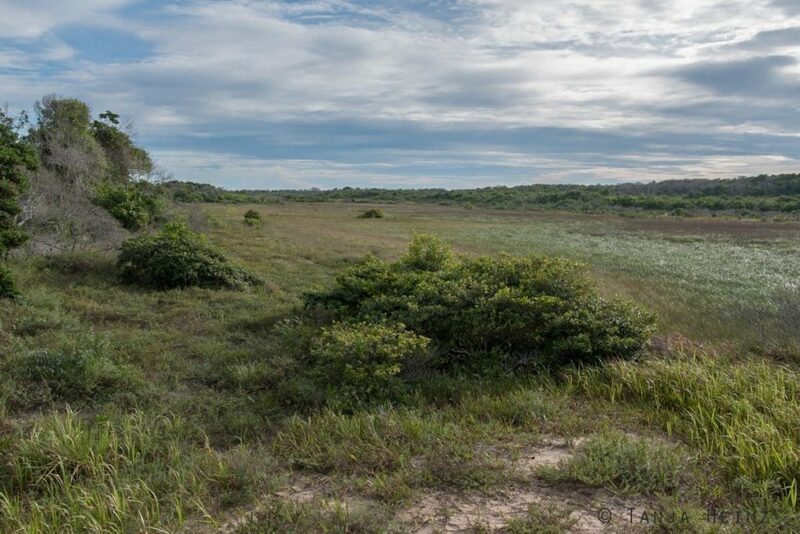 Sometimes along the path we got a view on open landscapes of the Parque Estadual de Itaúnas. Finally we reached the Trilha Buraco do Bicho. By the way, “bicho” means animal. However, we only saw some birds hiding from us as soon as they spotted us and some mosquitos. No sloth. No monkey. And of course no wild cat. But still the Trilha Buraco do Bicho is very special. Just watch the following photographs. The weather changed very quickly on those days. 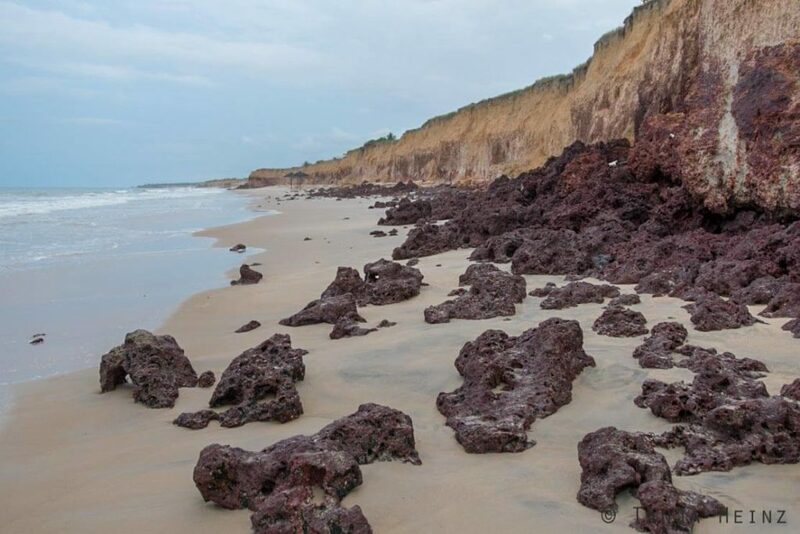 However, when we walked on the Trilha Buraco do Bicho we were very lucky and it did not start to rain. Thus, I was not only impressed with the beautiful sand dunes, but also with all the cloud formations on those days. The last part of the path led us to the beach. 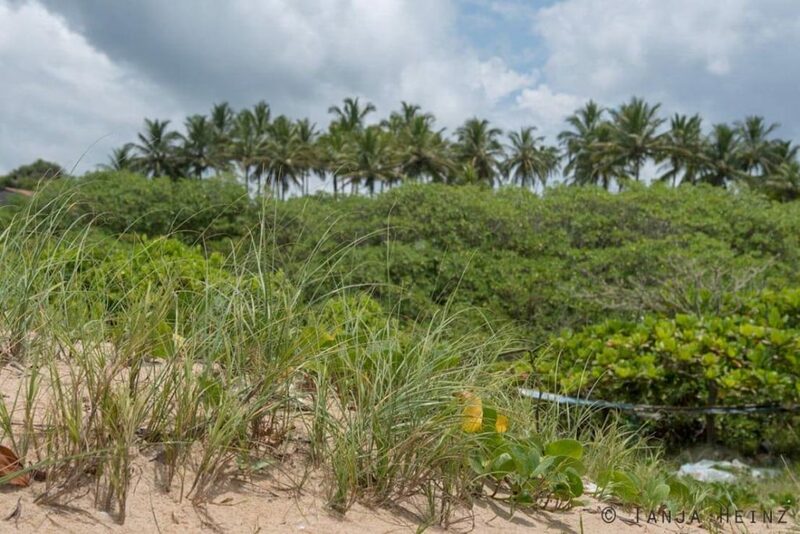 From there you will reach the beach shacks again and you can walk back to Itaúnas along the Trilha das Dunas. If you walk along the beach back to the beach shacks you might “meet” many Atlantic ghost crabs (Ocypode quadrata). That means, you cannot really see them from very close, because they are very, very, very shy. As soon as a crab spots you, it will run back into the water of the sea with high speed. No chance to see them from close. 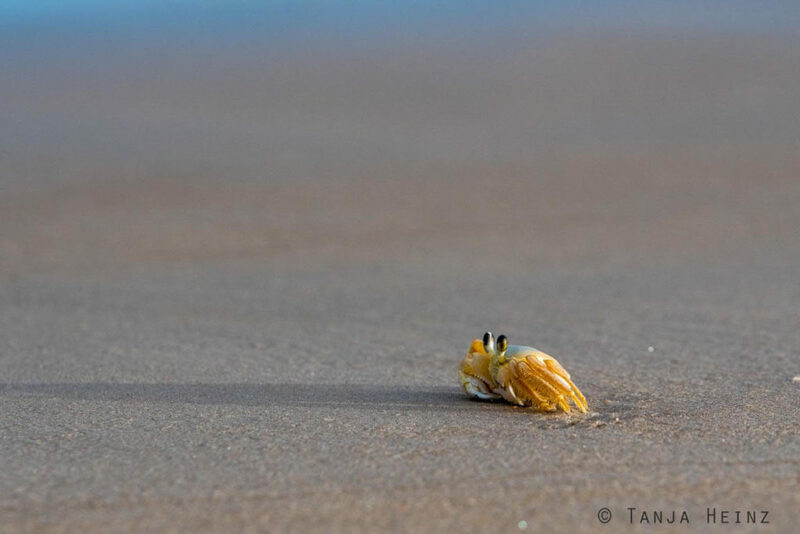 However, on that day when we walked along the beach we saw one solitary Atlantic coast crab at the beach. It did not move. At first we thought that this crab might be dead. But no, this crab was still alive. But what was wrong with it? Why didn’t it flee from us? We could not see it. I took a few photos, but we left again very quickly. Something might have been wrong with her because she did not flee. As we did not want to stress her, we stayed just for a few moments and left again. 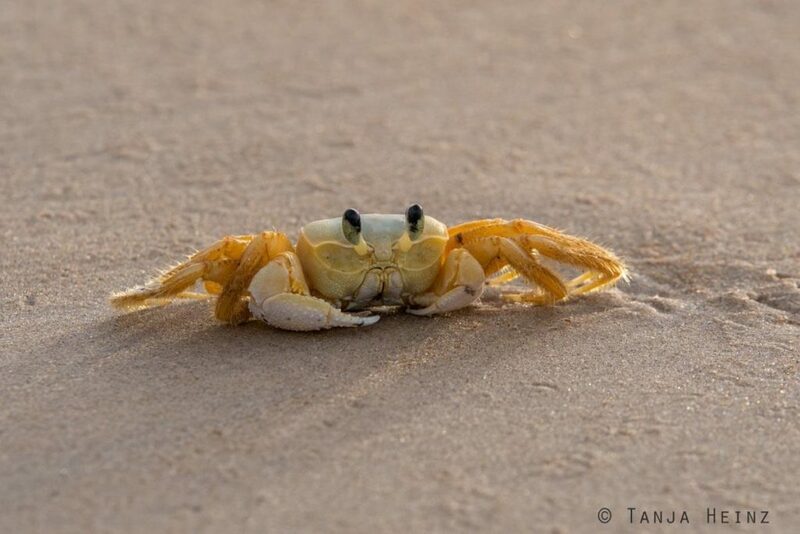 By the way, the Atlantic ghost crab is most active in the late afternoon or early evening, respectively. Exactly at that time we walked along the beach. Like many places in Itaúnas, we had the beach almost for ourselves. 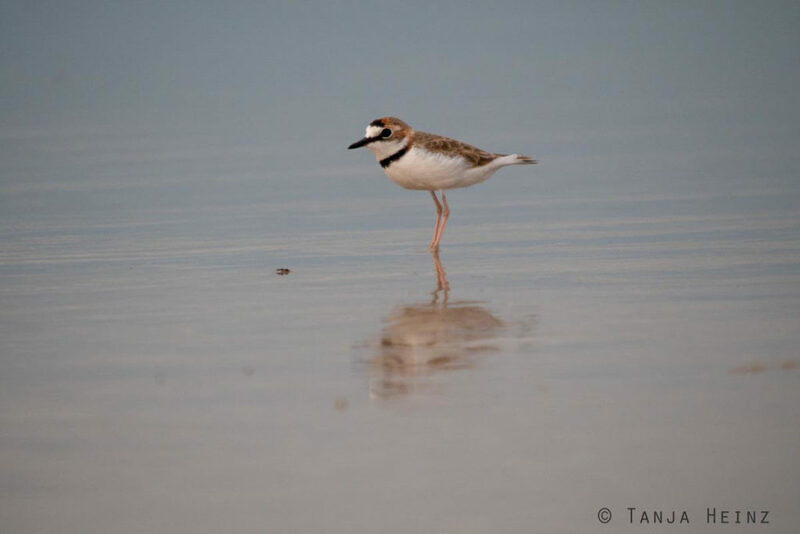 However, at this beach section we saw again a collared plover. 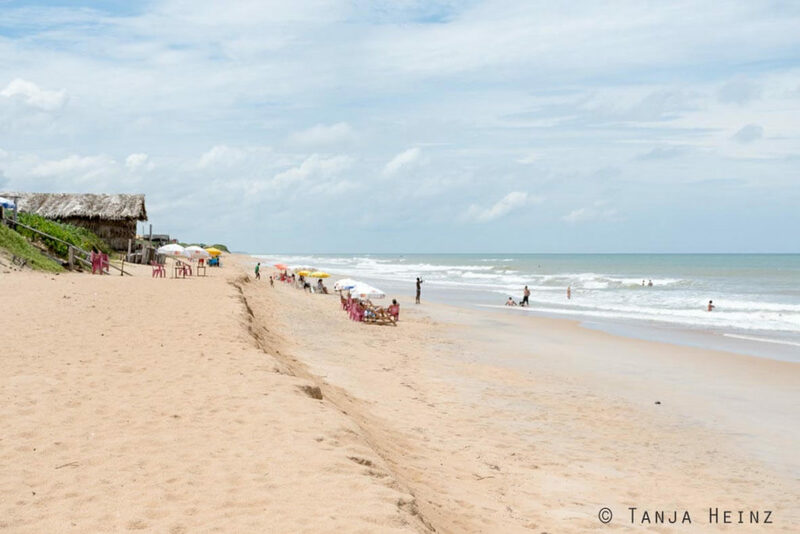 If you are looking for a quiet place, Itaúnas is the perfect place to be – even at the beach. 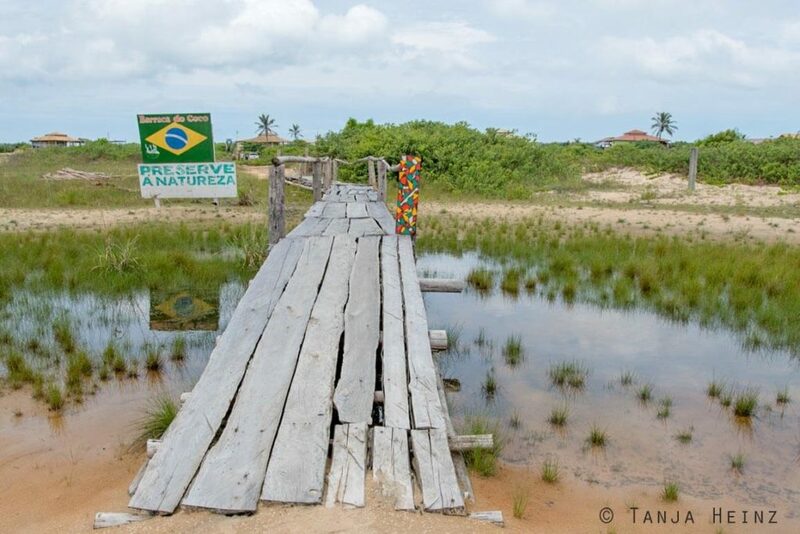 As Itaúnas is located in the North of Espírito Santo, it is very close to Bahia. 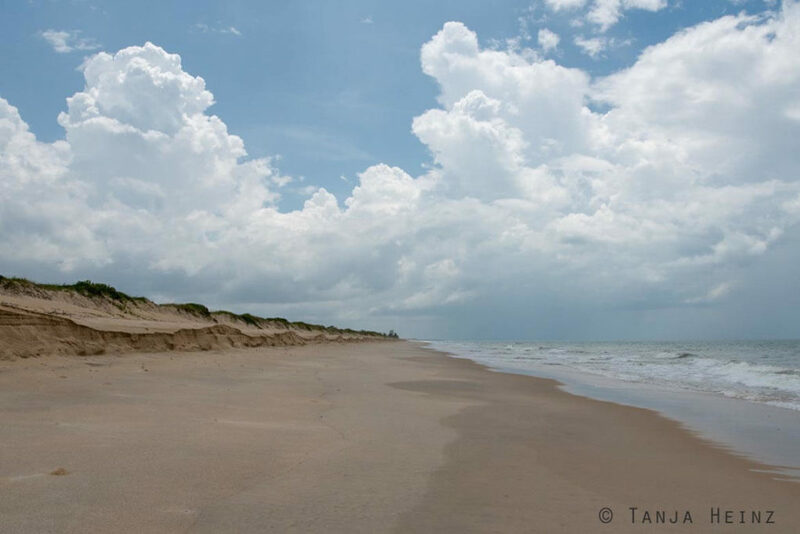 If you walk along the beach for about 8 kilometers until the Riacho Doce, you can reach Bahía from Itaúnas even by foot. As we had only two day, we had not the time to walk this path. We did not reach Bahia by foot, but joined a Buggy of the host of our pousada. 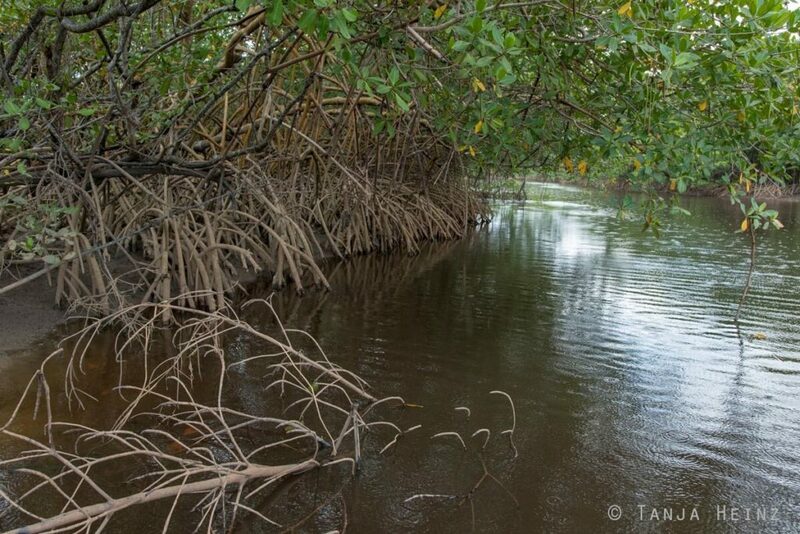 On this trip we saw more of the region around Itaúnas including many, many eucalyptus trees. Truth be told, I was surprised to see so many eucalyptus trees in Espírito Santo, in Brazil. This made me kind of thoughtful. Eucalyptus trees are indigenous in Australia and an important food resource for koalas as they can digest all the alkaloids and essential oils. However, most animals can not! Thus, I’m not surprised not to see many animals. Why should animals stay in a place where they cannot find food or protect themselves from predators? So far I knew eucalyptus forests from Galicia where I lived a few years. I loved the smell of the eucalyptus forests. However, I also was aware about the fact that eucalyptus forests are not good for the environment. At least in Galicia (not in Australia). Eucalyptus trees are very thirsty and require much water which they take from their surroundings. Because of this the Northwest of Spain suffered from heavy forest fires in recent years. I became thoughtful when I saw so many eucalyptus trees again in Brazil. Eucalyptus is especially important for paper producers. As I mentioned before, not many animals live in eucalyptus forests. However, I observed one bird. And that was the Southern caracara. Southern caracaras are widely distributed in Brazil. Thus, I observed more Southern caracaras as well for example in the Pantanal. 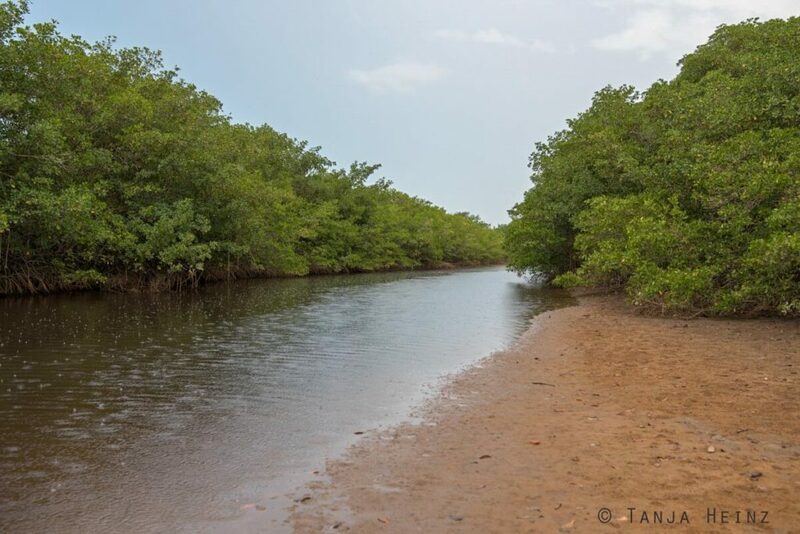 Our first stop to Bahia was at a river surrounded by mangroves. As the weather was changing were quickly those days, it started to rain for a short moment when we were at this river. 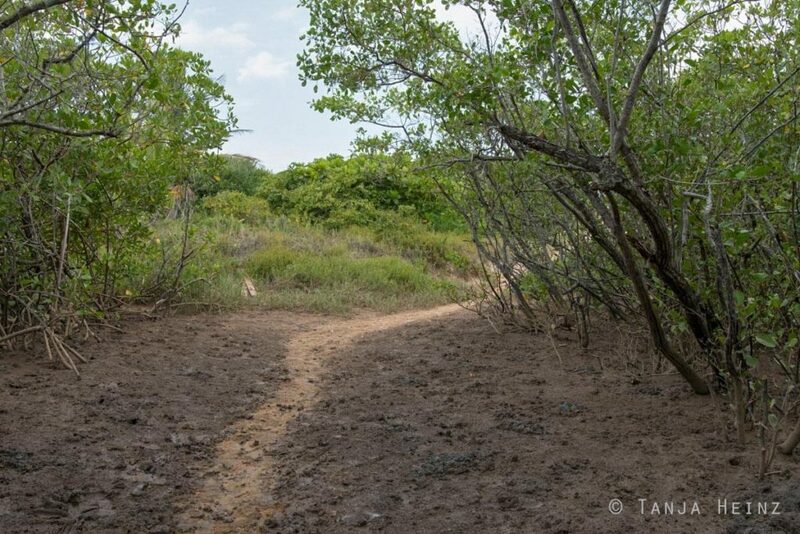 We crossed the river and reached a path that led to the beach. 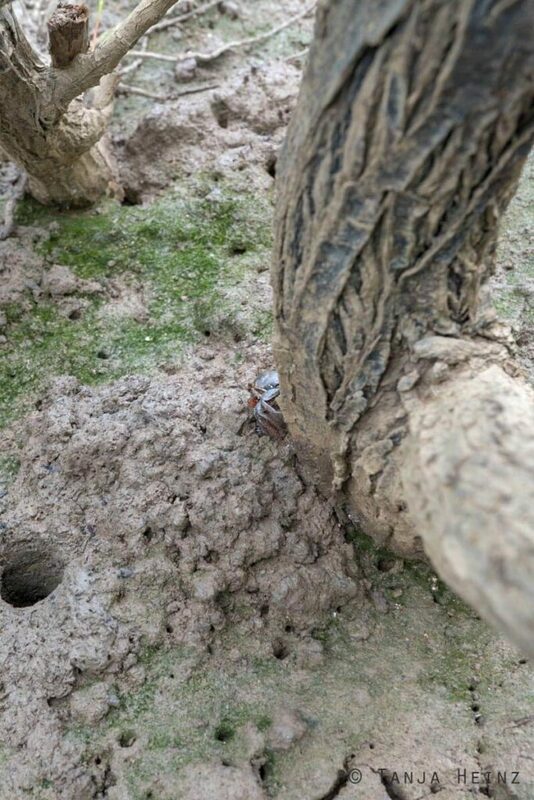 At the beginning of the path we saw many, many mangrove tree crabs (Aratus pisonii). Unfortunately, I cannot tell you where exactly we had been as the owner of the Pousada guided us to this places. However, I can tell you that this place is close to the Riacho Doce anywhere in the South of Bahía. 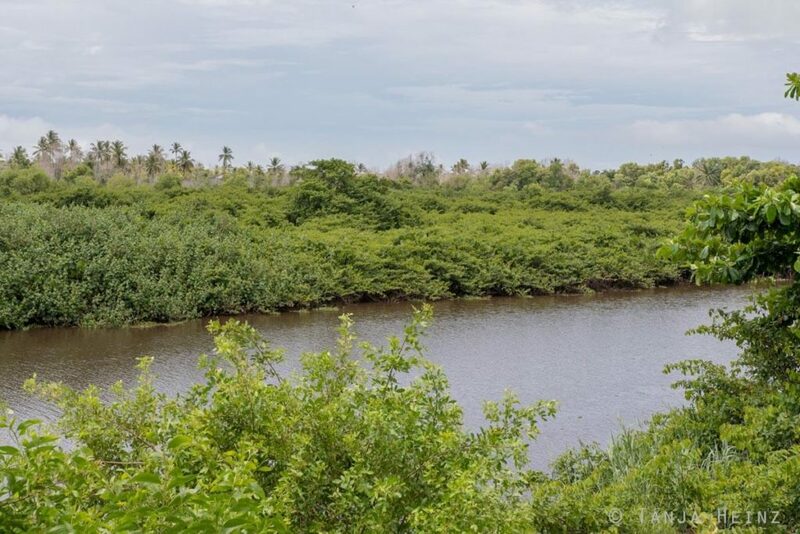 If you look away from the sea into the other direction you will see the mangroves from above and more behind some palm trees. 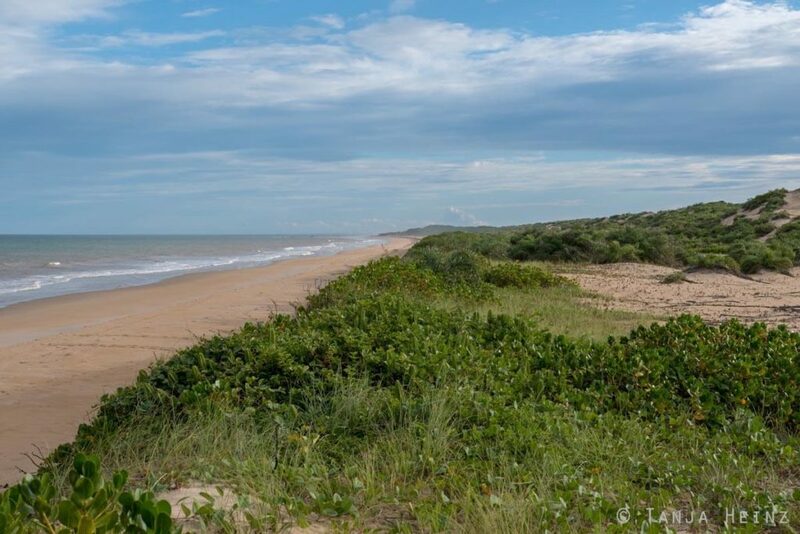 On our route we visited several places in the South of Bahia including the beach Costa Dourada. During this stop we ate in a restaurant at the beach. We found shelter under the roof of the restaurant as the sky became again darker and darker in that moment. At this place I especially liked the escarpments at the beach. 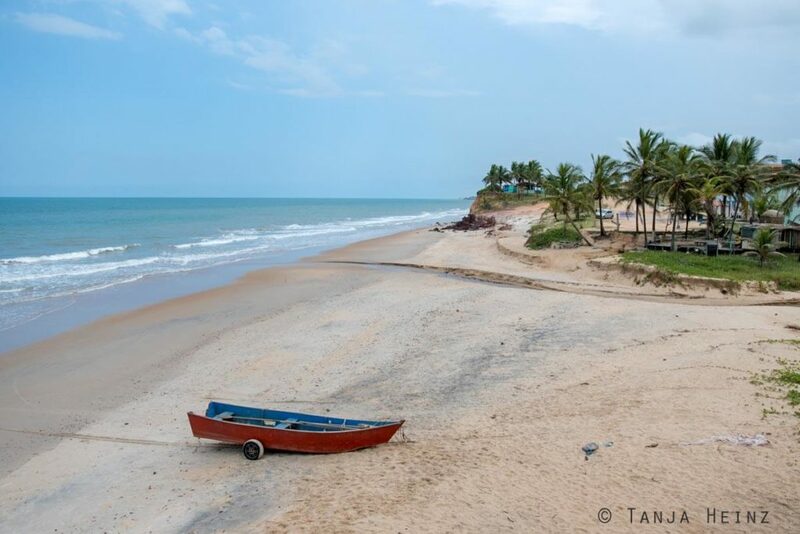 Itaúnas in Espírito Santo is a wonderful place where you can relax and enjoy life. 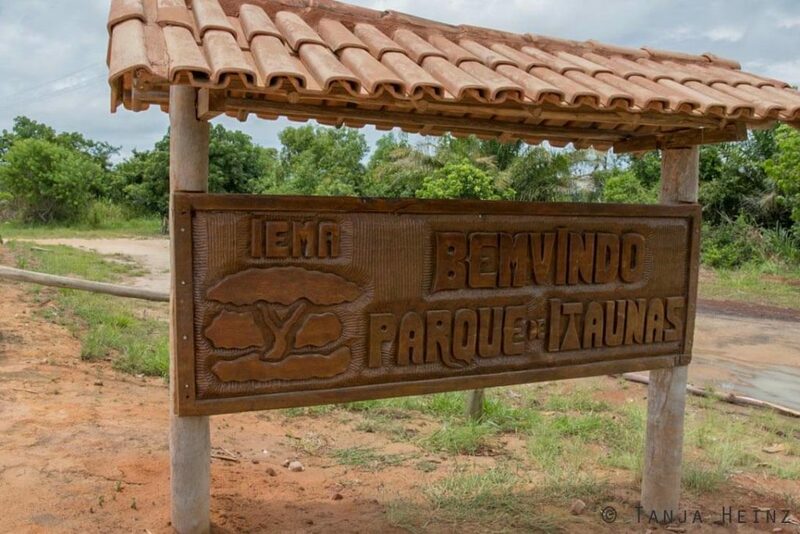 With respect to wild animals, if you wish to see more than birds I would not recommend Itaúnas in the first instance. Except if you wish to observe sea turtles. But you really have to be in Itaúnas before (!) march. However, I cannot tell you here my experiences about sea turtles in Itaúnas. 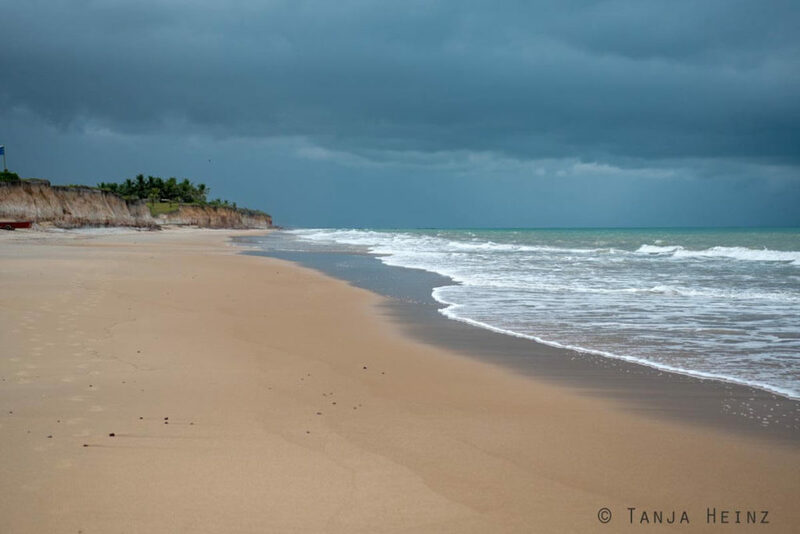 Although I could not see sloths, monkeys or sea turtles, I spent a wonderful time in Itaúnas. The Aeroporto Internacional de Salvador in Bahía, the Aeroporto Internacional Confins in Belo Horizonte, Minas Gerais, but also the Aeroporto Internacional Galeão in Rio de Janeiro and the Aeroporto Internacional Guarulhos/Cumica in São Paulo are the closest international airport. Although there is an airport in the capital of Espírito Santo, there are no direct flights from for example Europe to the Aeroporto Vitória. Brazil has a very good bus transport network. We travelled from Caratinga to Itaúnas. That means, at first we took a bus from Caratinga to Vitória with the bus company Gontijo. The bus leaves late in the night just before midnight. Important to mention here is, that we could not buy this bus ticket from Caratinga to Vitória on neither Clickbus nor Brasil by Bus, because the timetable of this bus line can change last-minute. As the bus from Caratinga leaves late in the night, we arrived Vitória early in the morning. The journey from Caratinga to Vitória with Gontijo takes about 5 hours and costs around 70 R$. In Vitória we bought a ticket from the bus company Águia Branca from Vitória to Conceição da Barra. We bought this ticket at the ticket desk in Vitória. However, if you travel from Conceição da Barra to Vitória I recommend to buy a ticket not last-minute because if you do so you might not get a seat (and that means a ticket). There are only three buses from Vitória to Conceição da Barra per day. The journey from Vitória to Conceição da Barra takes between 5 and 6 hours and you have to pay between around 70 R$ and 90 R$. 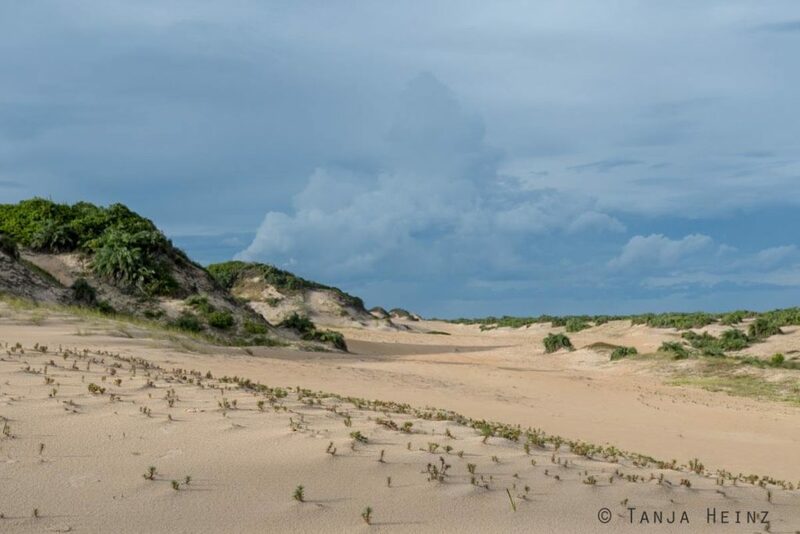 Conceição da Barra is about 30 kilometers from Itaúnas and the next town with a long distance bus connection. Thus, from Conceição da Barra you need to take another bus to Itaúnas. And that is from local buses from Mar Aberto. There are four buses during the week from Monday to Friday and three on the weekends. There is a Mar Aberto bus from Conceição da Barra to Itaúnas at 7:00, 12:30 and 15:30 every day, but also one at 10:30 during the week. If you take a bus from Itaúnas to Conceição da Barra you need to decide between a bus from 8:00, 13:30 and 16:30 both on weekdays and at the weekend, but there is an additional bus during the week at 11:30. You need about one hour to travel between Itaúnas and Conceição da Barra. We paid 9,70 R$ for the bus. We booked our accomodation on Airbnb at the Pousada Mirante de Areia. 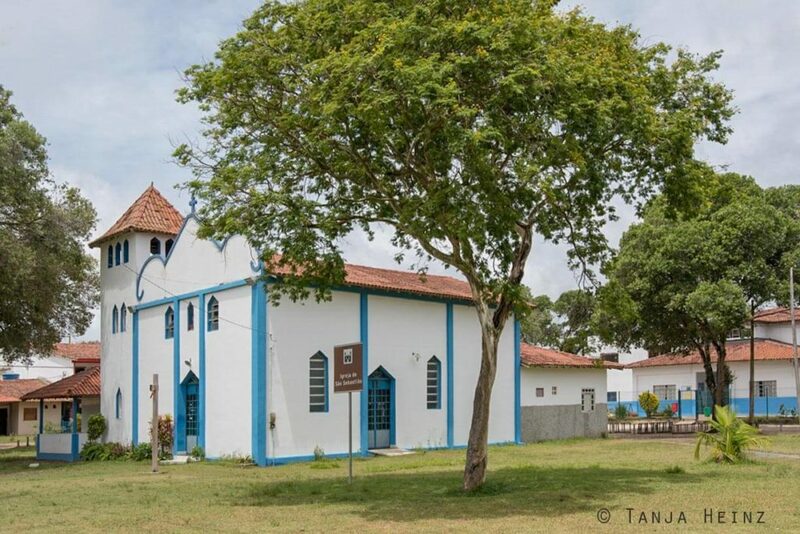 The pousada is located in the Rua Theofilo Cabral, 148, Itaúnas, Conceição da Barra, 29965-000. We enjoyed our stay at this pousada. The rooms were very clean, comfortable and quiet. The breakfast was included and very delicious. We paid 37.00 Euro for one night at this pousada. 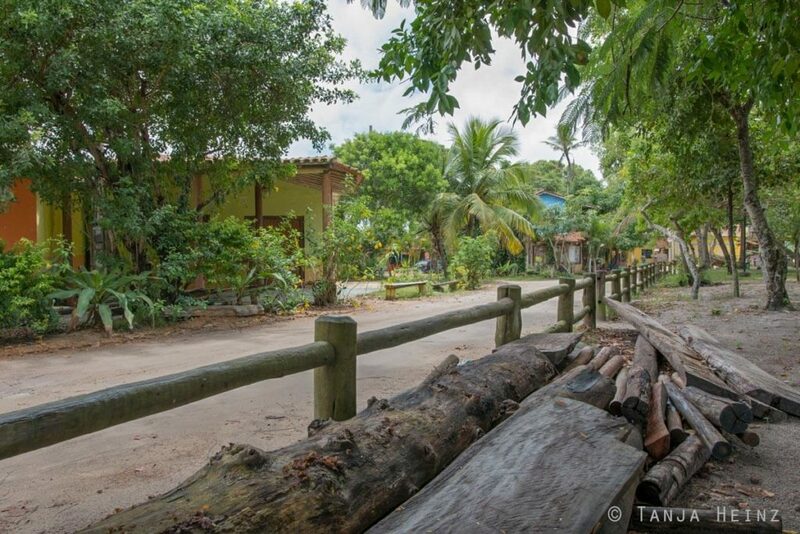 As we did not stay in Itaúnas during the main season we paid a relatively low price for our stay. If you plan to visit Itaúnas during the main season, you most probably have to pay more for one night. By the way, we were not the only guests in the pousada in march. 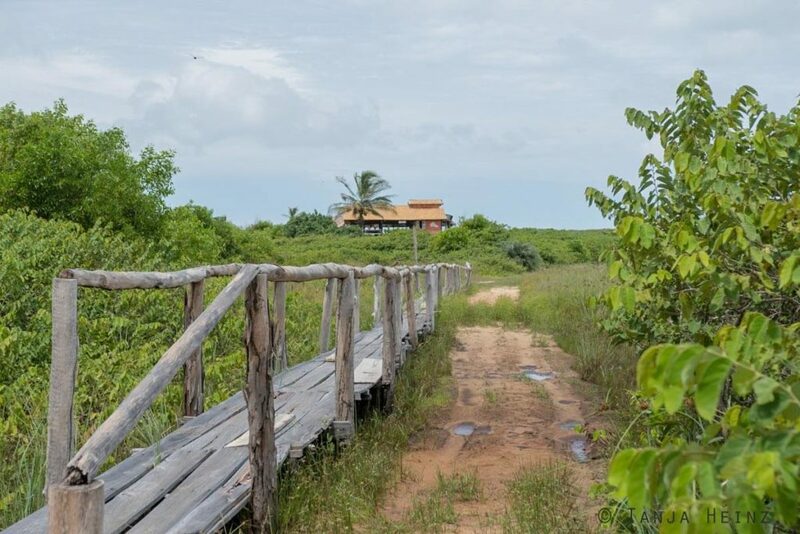 If I visit Itaúnas again, I would stay at the Pousada Mirante de Areia again. 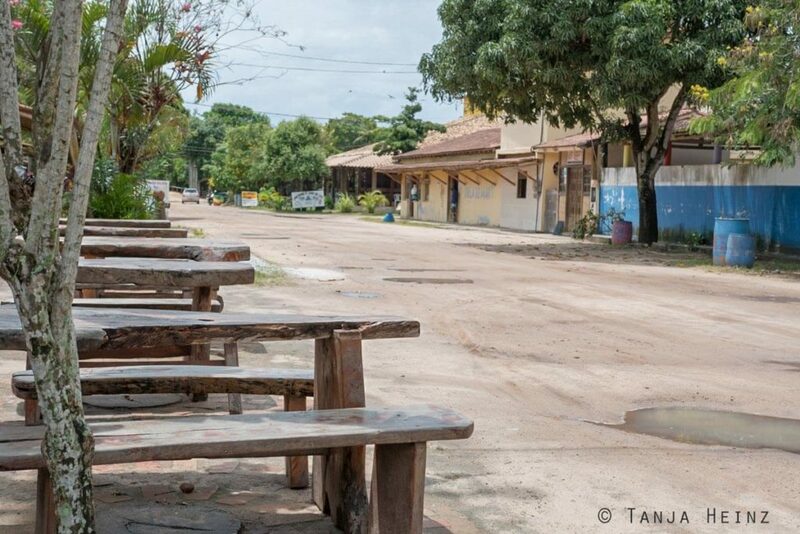 As Itaúnas is very small there is no car necessary within the town. 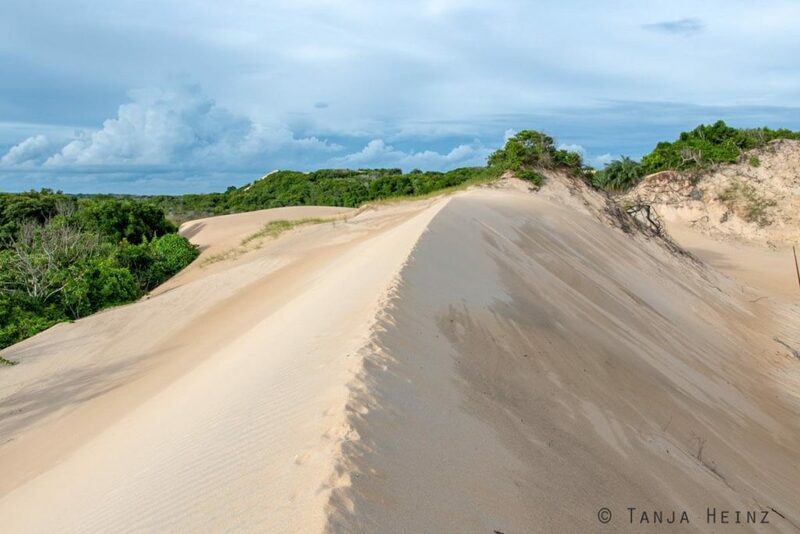 Even the sand dunes are easy to reach by foot. 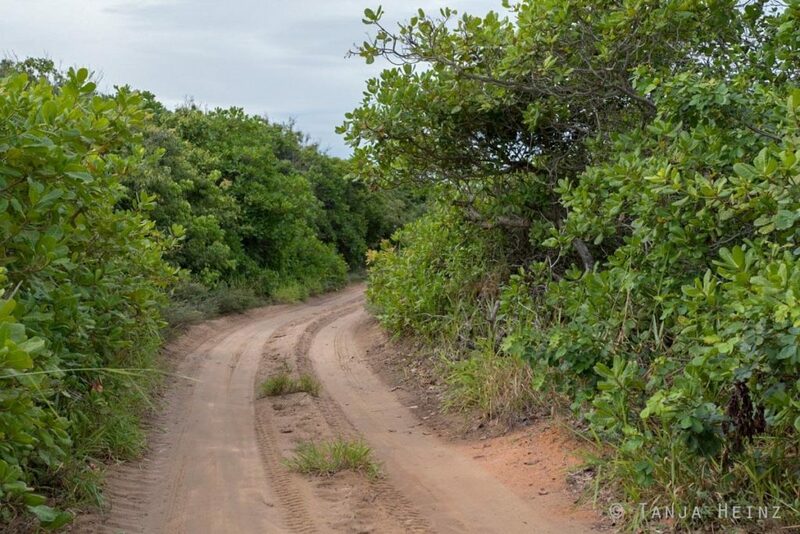 However, if you wish to explore more the surroundings of Itaúnas, you need a car. 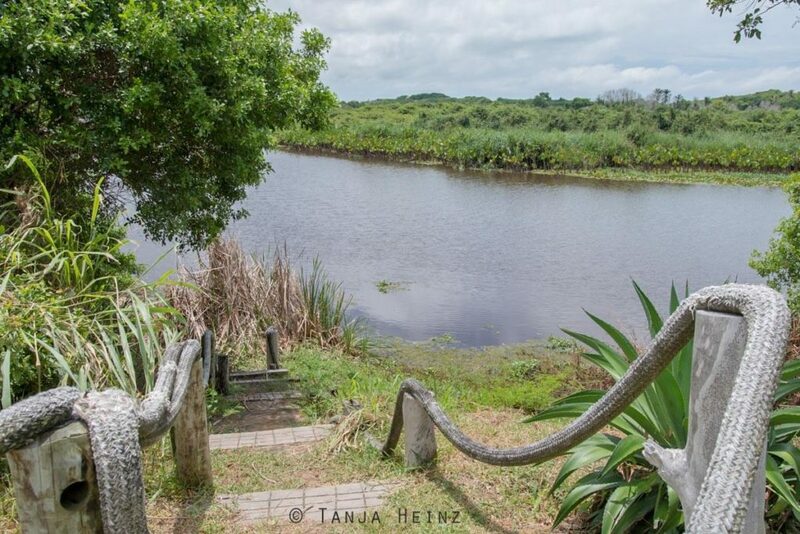 As we moved around with a buggy – driven by the owner of the pousada – we did not rent a car. The day with the buggy cost 250 R$ for two people.